(Wellington, FL) – A crowd of more than 200 people came out to see the first one-stop shop outpatient health center of its kind in Wellington this past Saturday, November 26. The new Bethesda Health Urgent Care/Women’s Health and Imaging Center is a state-of-the-art medical plaza that sees cares for everyone from infants to seniors and is redefining healthcare by providing quality not-for-profit health services in a caring manner, Bethesda Health’s mission in serving Palm Beach County since 1959. During the dedication ceremony, Wellington Vice Mayor John McGovern shared some important thoughts about the importance of having this new Center to serve families and the community. Bethesda Health President and CEO Roger Kirk also recognized key individuals who had been instrumental in getting the Center built, including general contractor Joel Barham, and architect Les Chyzacczyk, LCA Architecture. 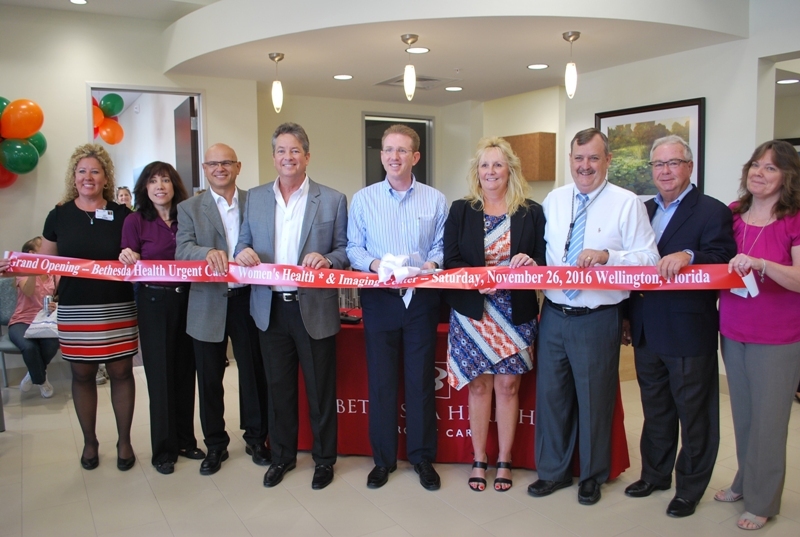 This historic occasion commemorates Bethesda Health’s commitment to serving the residents of Wellington with a multi-level care outpatient health facility to call their own, which is affiliated with not-for-profit Bethesda Hospital West, located on State Road 7/US-441. The Grand Opening Celebration included free health screenings, tours, refreshments, as well as face painting and a teddy bear hospital for the kids, that lets kids be “Doctors and Nurses” for the day. Located at 10520 Forest Hill Boulevard, Bethesda Health Urgent Care is open 7 days a week, 365 days a year, from 10:00 a.m. to 10:00 p.m. Bethesda Health Urgent Care sees everyone from babies to seniors. With the Bethesda Health Imaging Center located in the same building, patients can receive any needed X-rays or CT scans during their visit. The Bethesda Women’s Health Center offers a comprehensive array of breast care services including 2D and 3D mammography, as well as bone density screenings and ultrasound. With spa-like amenities, Bethesda Women’s Health Center offers a tranquil and healing setting for their healthcare, and it is open from 9:00 a.m. to 5:00 p.m. Monday-Friday. For those seeking a physician, the Bethesda Health Physician Group (BHPG) is located in The Plaza at Wellington Green, just around the corner. With physician specialists in Primary Care, Family Medicine, Internal Medicine, Cardiology and General/Vascular Surgery, the BHPG Wellington office is located at 2465 State Rd/ 7. Suite 800, across from Office Depot. Founded in 1959, Bethesda Health, Inc.’s mission is to provide quality health services in a caring manner. With two not-for-profit hospitals, 401-bed Bethesda Hospital East and 80-bed Bethesda Hospital West, Bethesda Health is comprised of more than 670 physicians and 2,500 employees. Bethesda Health and its affiliates offer a full array of healthcare services, including the Bethesda Heart Hospital for cardiovascular services; the Bethesda Orthopaedic Institute; general, vascular and endovascular surgery, maternity, neonatal and pediatric intensive care, cancer services and women’s health. Bethesda Hospital West, which opened in January 2013, is an 80-bed, all private room, state-of-the-art hospital, with a 24-hour Emergency Department for adults and children, located on the corner of Boynton Beach Boulevard and US-441. Services include: general, medical, surgical and intensive care, a state-of-the-art interventional hybrid OR suite, as well as diagnostic imaging and rehabilitation. Bethesda Health is honored to be part of a consortium of Palm Beach County hospitals selected to partner with Florida Atlantic University’s Charles E. Schmidt College of Medicine Graduate Medical Education program. Visit us at www.BethesdaWeb.com.